So beautiful, isn't she? Here's a nice photo from a scene in the episode, "Klaus." 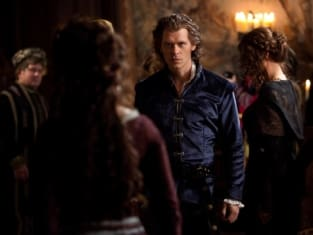 The Vampire Diaries Season 2 Episode 19: "Klaus"
The Vampire Diaries Photo Preview II: The Real Klaus Cometh! That is too sad for me to accept, my lord. Life is too cruel... if we cease to believe in love, why would we want to live? Damon: You should be thankful sheâ€™s here. Sheâ€™s keeping me from going for what I really want. Stefan: Youâ€™re right. Thank you for being in love with my girlfriend. The Vampire Diaries Round Table: "Klaus"
The Vampire Diaries Review: "Klaus"